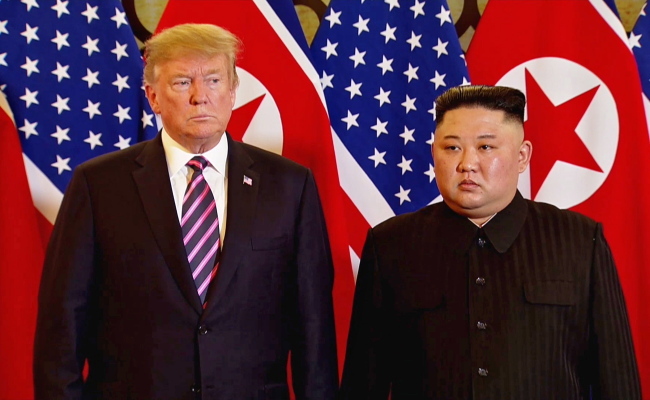 Following the failure to reach an agreement at last month’s summit between the US President Donald Trump and North Korean leader Kim Jong-un in Hanoi, tension has been building between the two sides, threatening the negotiations that they have built over the past year. The communist leader warned in his New Year’s speech this year he would have to find a new way for defending the North if the US did not keep its promises. As the US appears to have no intention of taking the “commensurate measures” the North seeks for the denuclearization steps it has taken, speculation has grown as to whether Kim will take this route. North Korea’s Deputy Foreign Minister Choe Son-hui held a news conference in Pyongyang on Friday, in which she indicated that the country would not yield to the US demands put forward in the Hanoi summit. She added that Kim would soon make an announcement on his country’s direction, to decide on whether to resume missile launches. “What is clear is that the US has thrown away a golden opportunity,” she said. Trump and Kim sat down for a two-day summit in Hanoi, Vietnam, from Feb. 27 to 28 to strike an accord on denuclearization. But the talks ended without an agreement, as the two sides failed to narrow their differences over what each side was willing to give. While Washington demanded North Korea dismantle of all of its nuclear weapons program first, Pyongyang insisted on the lifting of economic sanctions in its “entirety,” while taking incremental steps for denuclearization. Choe blamed the US Secretary of State Mike Pompeo and national security adviser John Bolton for the summit’s failure, saying they “created an atmosphere of hostility and mistrust,” according to the Russian news agency TASS. Choe’s statement came as satellite images of North Korea’s satellite and missile facilities appear to suggest activities at those sites, triggering concerns that North Korea might break the self-imposed moratorium on missile tests that has lasted for 15 months. North Korea last tested what it claimed to be a hydrogen bomb in September 2017, and launched an intercontinental ballistic missile in what appeared to be a successful test two months later. Following the reports on satellite images, Trump said that he would be “disappointed” if Kim were really rebuilding the Sohae site. In his New Year’s speech on Jan. 1, Kim expressed a strong determination to end the military hostilities on the Korean Peninsula and vowed to work hard to draw an agreement with the US that could be welcomed by the international community. While signals from the two sides so far indicate that the bilateral talks are still viable, experts cautiously raised the idea that Kim might opt for a “new path,” which some suggest may be a return to Byungjin policy. “There are different opinions on what the ‘new way’ may be. But North Korea has hinted several times last year that it could return to the Byungjin policy.” Cheong Seong-chang, vice president of research planning at the Sejong Institute, told The Korea Herald. The Byungjin policy, declared in a plenary session of the Party Central Committee in March 13, aims to promote a parallel development of nuclear weapons and the economy. 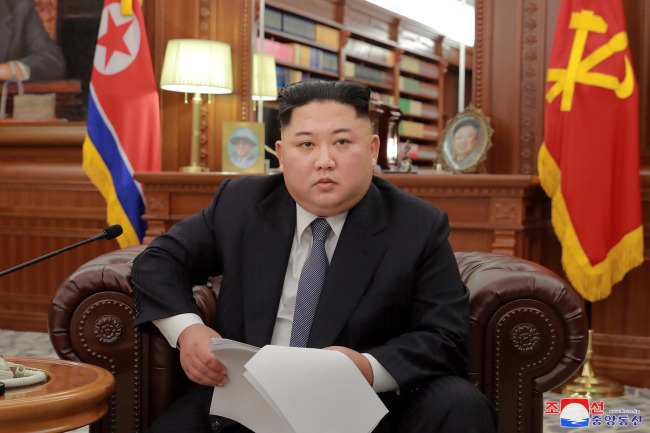 In April 2018, the North Korean leader declared the “final victory” of Byungjin strategy and said he would suspend nuclear tests and close nuclear test sites, officially ending the policy. In a Foreign Ministry Statement issued in November 2018, however, Pyongyang said that it could “revert to its former policy” if the US did not change its position on sanctions. “The word ‘byungjin’ may appear again and a change in line could be seriously reconsidered,” said the statement carried by the Korea Central News Agency, on Nov. 4. Another “new way” could be for the North to promote its own denuclearization timetable and to negotiate with its allies, China and Russia, who are permanent members of the UN Security Council. The permanent members, which also include France, the UK and the US, hold the power to veto resolutions. “Pursuing Byungjin policy will only reinforce international sanctions and further isolate the North, and I believe it would be impossible for the North to endure the mounting pressure from the dissatisfied North Korean people much longer,” Hong Min, the director of the North Korean research division at the Korea Institute for National Unification, told The Korea Herald. There are many reasons why Pyongyang negotiates with the US, Hong said. The US provides a nuclear umbrella to South Korea and a peace treaty can be signed with the US, a signatory to the 1953 Korean War Armistice Agreement that ended the war on the Korean Peninsula in a cease fire. However, if North Korea finds the US too difficult a partner in discussing lifting of economic sanctions, while fulfilling the denuclearization commitment at its own pace, it may look for an easier counterpart, Hong said. “Pursuing the denuclearization commitment with China or Russia could also mean negotiating with the international society. If Kim takes dismantling actions and its allies verify it, how would UNSC be able to maintain its sanctions against the North?” Hong said, adding that international organizations would also have to be involved in the verification process. Park Won-gon of Handong University also said that Kim’s new way could refer to strengthening relations with China, so that he can follow his own timetable on denuclearization. “From North Korea’s perspectives, it is taking denuclearizing actions, in its own way, following its own timetable. So if the talks with the US fail, it could take an entirely different way to make a deal with China or Russia and obtain part of its sanctions off,” Park said. The rocket engine test site at the Sohae Satellite Launching Station, which was partly dismantled last year, is being rebuilt, according to analysis of satellite images. 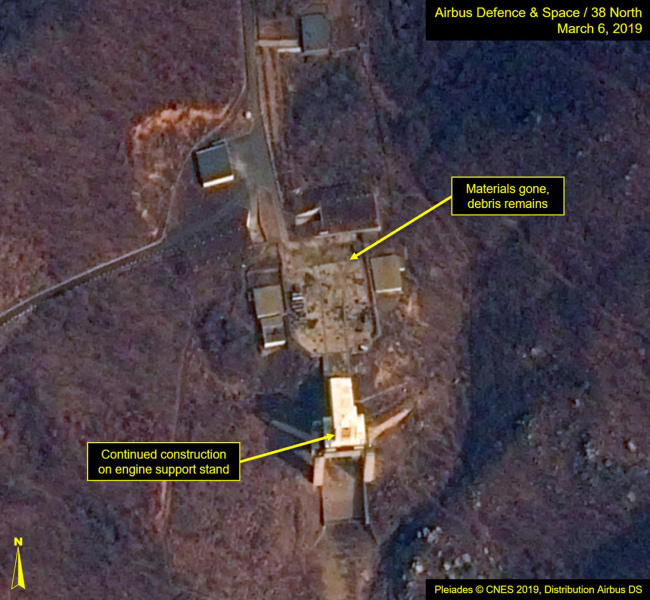 Movements have also been detected at Sanum-dong Research and Development Facility, where ballistic missiles and space launch vehicles are being developed. As well as ballistic missiles, satellite launches are also regarded as banned under sanctions on North Korea. Experts cautioned, however, that it is premature to conclude that the negotiations between Pyongyang and Washington to have ended, and that the possibility of North Korea launching a missile or a satellite is low. 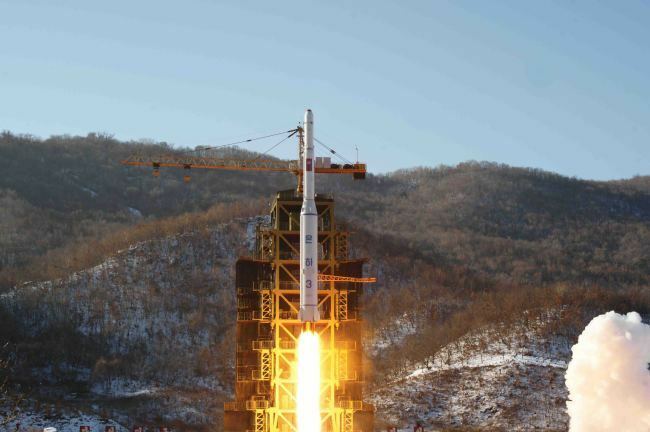 “Whether it is a satellite or a missile, launching one would be too risky for Pyongyang, because it would mean giving up its year-long trust-building efforts aimed at being seen as a ‘normal state,’” Hong said.